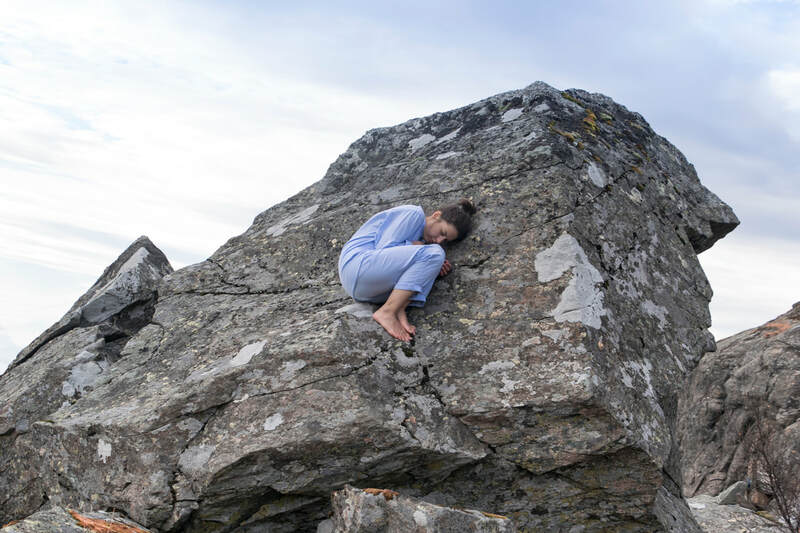 "High Land" is a multidisciplinary project exploring the relationship between Human and Mountain, a transformation of a human in the highlands, wonder, freedom and eternity. What is it there in the Highlands that keeps calling men since ancient times? How can one tell a story of reverence and put in motion ancient awe, knowledge and understanding of power, mystery, and the sublime of the mountain? In the course of multiple expeditions, I tap into the mountains’ primal energies and listen to the land: does the mountain speak as a father, a sister, a friend, a lover, or all of the above and more? 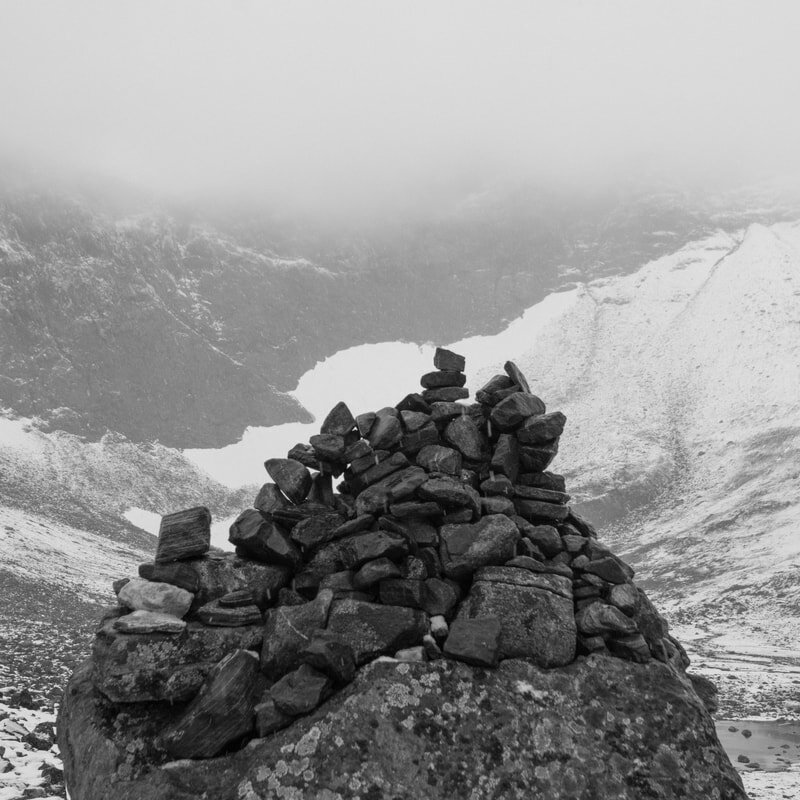 Discovered and invented mountain rituals, landscape encounters and my personal experience as a mountain walker lay base for series of photographs, performance pieces, videos, gestures, collages, drawings, sound works, and installations. "The Call of The Mountain"
series of large-scale collages-symbols, encompassing the splendor of the Mountain. The images are conglomerated from numerous pictures of the portrayed landscape, ​taken within the continuity of the mountain walk. "Landface" — a series of self/land-portraits, exploration with intimacy with landscape and being a part of something greater. 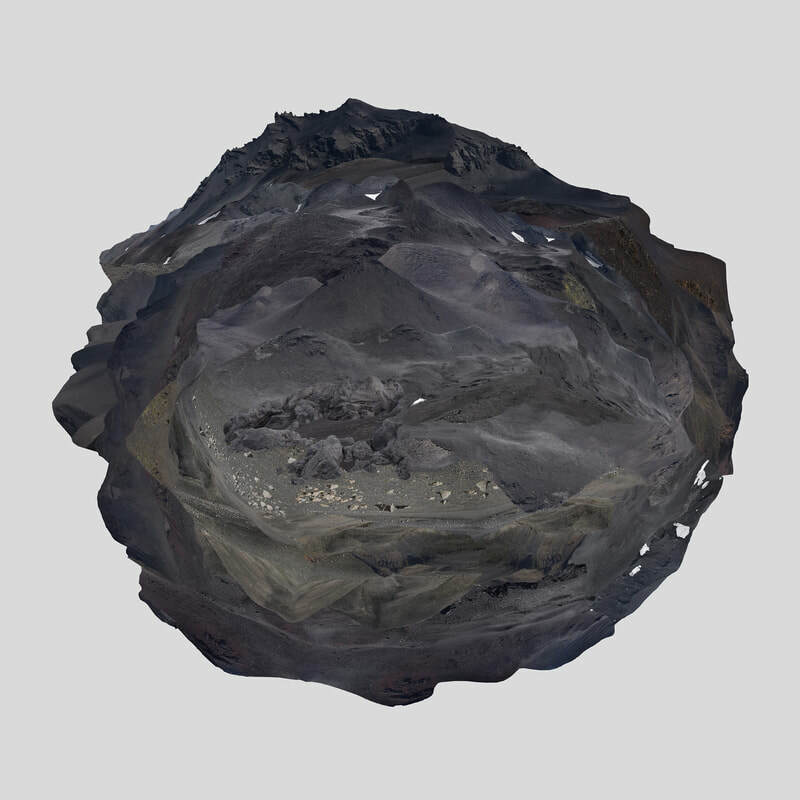 The face and sight are covered by masks, made from elements of the surrounding landscapes. Through the mask-ritual a body becomes a listening body; through physical blindness other senses grow acute. A trusting, intuitive body enters the mystery of land, breathing in unison, inheriting the wisdom of the mountain’s body. 4-hour performance documentation. Performed and recorded during my return to the very first mountain I had climbed. 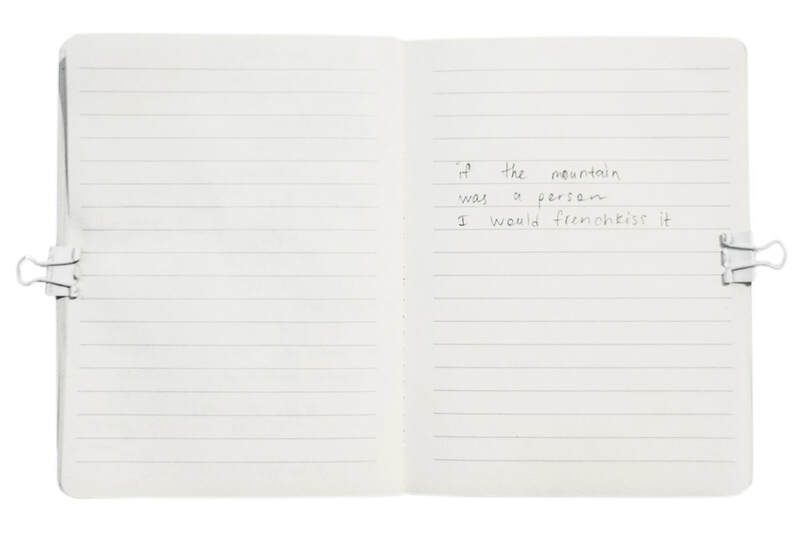 The work records the act of going up the mountain with simultaneous continuous repeating: “My heart’s in the Highlands”. 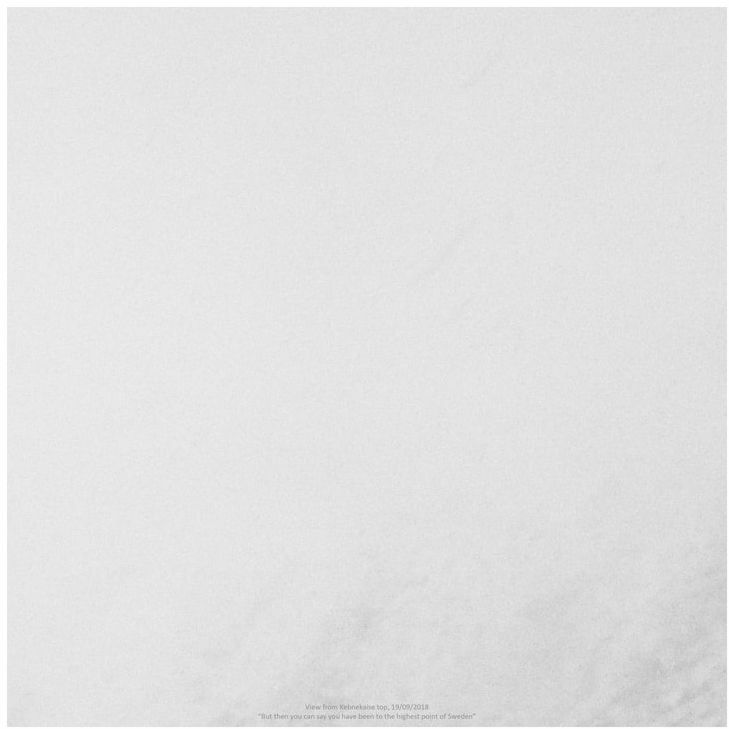 A prayer, an incantation, a song of a constant longing for the highlands - this work makes the duration and physical exertion of a mountain ascent palpable. 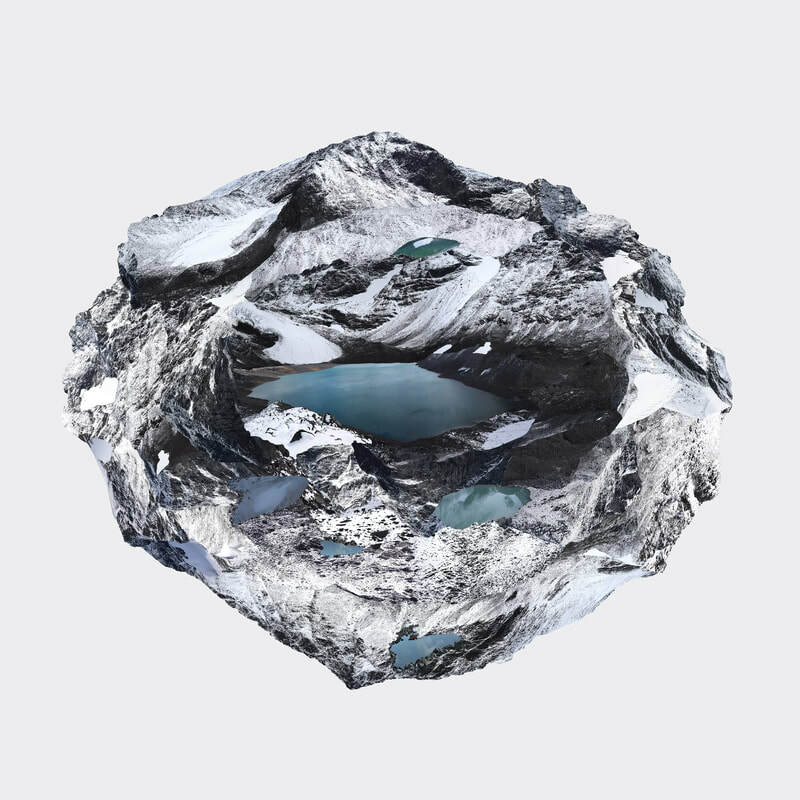 The process of making these works is a meditative, almost trance-like act of caressing the mountain with hand and pencil. The mountain’s body is to be documented by touch and taken-with to the lower lands. "The Mountain soul is always blue, so are their dreams"
Sharing a sleep or sleeping in the presence of the Other is the event of trust. Sleeping on the mountain as the way to open and surrender to the enveloping sublime of the mountain, its roughness and its tenderness. The sleep in the higher places is a sleep in a proximity to the sky and, as some monks believe, in proximity to the gods and eternity. 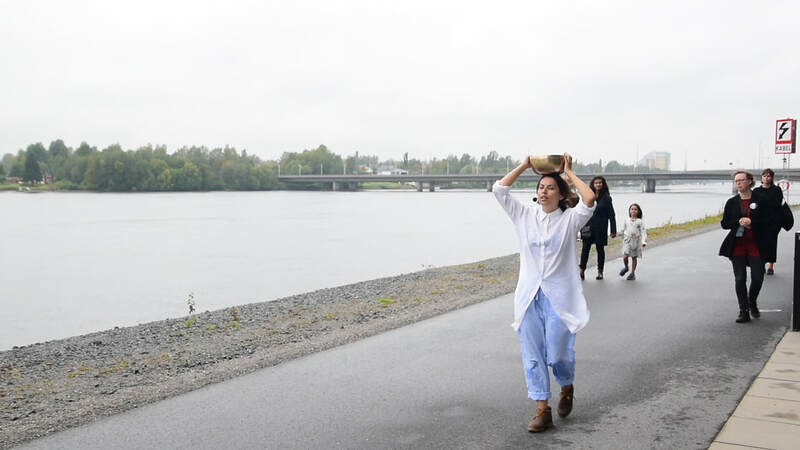 "Offering to the White Mountain"
Performance for the camera, referring to the nomadic herders’ tradition of offering “white food” (dairy products) to the spirit of the Mountain as a symbol of their reverence. Every morning a female member of the family (usually the herder’s wife) tosses an offering of milk in five directions: upward to the sky and in the four directions of the compass, the four directions of the wind. 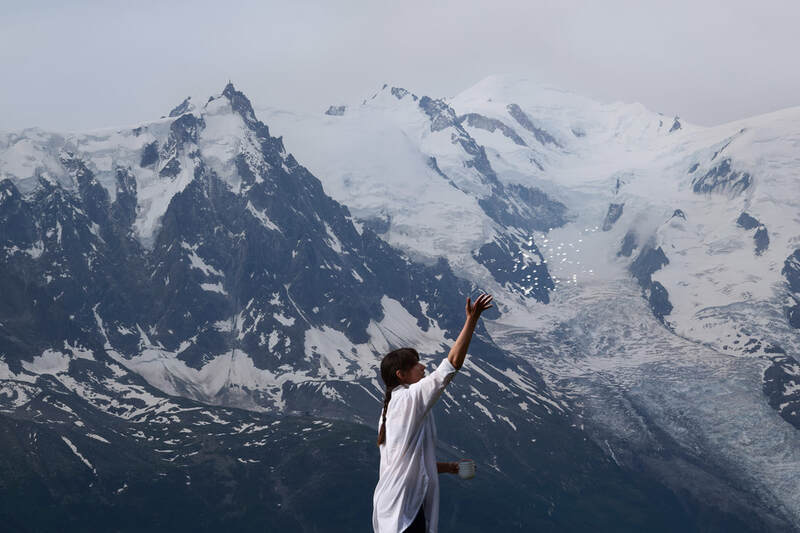 On this video, the artist sprinkles the milk at the site of Mont Blanc – the White Mountain. 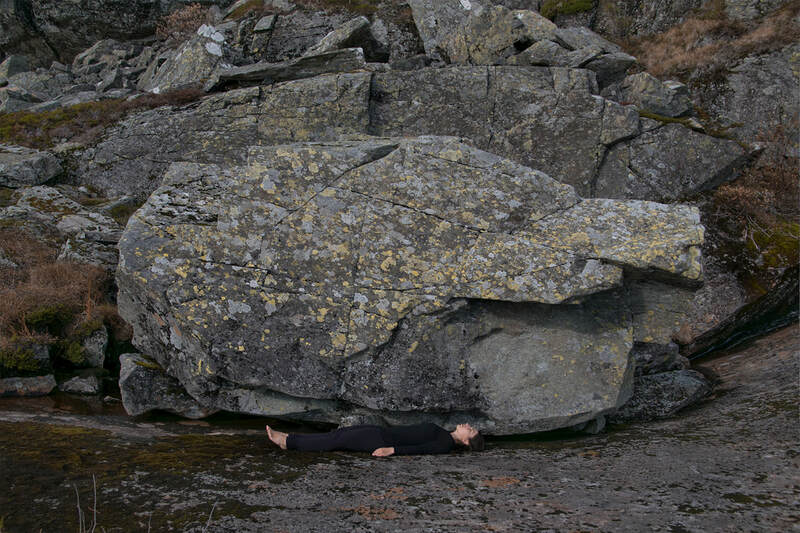 ​The act of “disembedding” a ritual from a particular area and culture and “embedding” it into a new context articulates the universal value of the respect for nature. 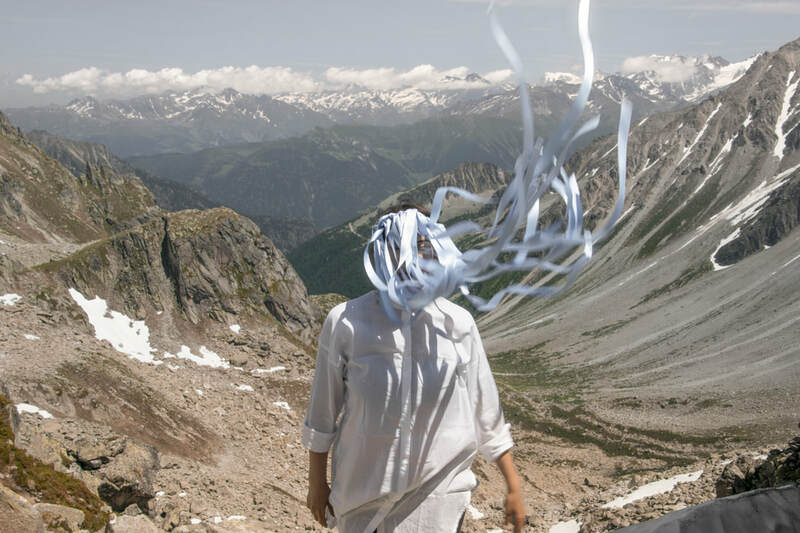 Performance for the camera, referring to the belief that only pure people (with good intention and spirit) are allowed to walk the mountain, as the mountains in many cultures are believed to be sacred. The performed ceremony is a “purification” ritual: burning white envelopes near the mountain and glacier stream on the evening before a demanding mountain ascent. 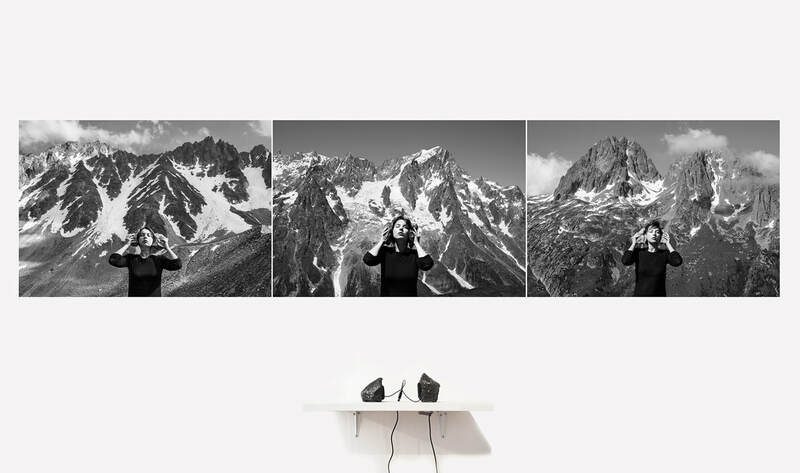 "Rock Music" is a series of three photographs, accompanied by a sound piece: subtle sounds recorded in the mountains during trekking in the Alps: white noise, wind swirls, mountain streams, echoes of cow-bells and singing animals. French Rock. Swiss Rock. Italian Rock. Three countries, one quiescent symphony. "The Journey ​Through The Borders"
a book with 6 photographs, picturing a circuit journey of a stone, ​crossing borders of three countries. "High Land: to the wild air"
​Mountains are the nearest to heaven, a meeting-place between the heavenly and the earthly, where human spirit is believed to undergo a great inner transformation. 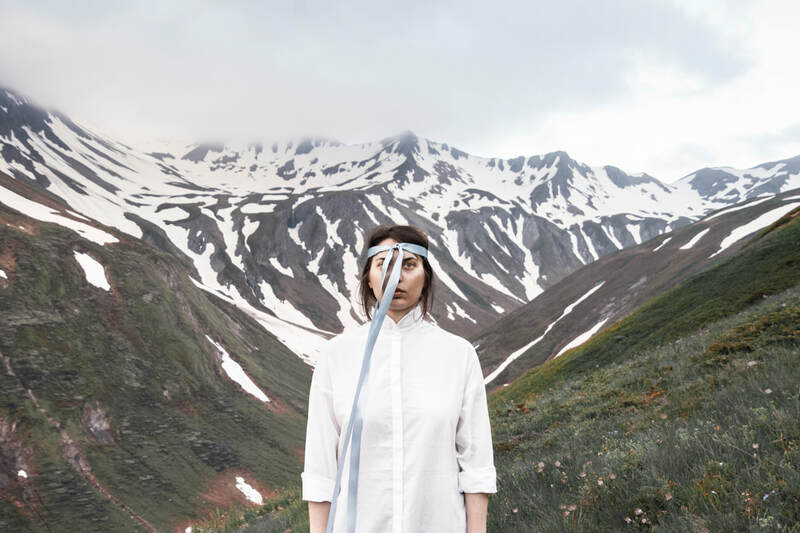 Every day during the multi-day trekking in the Alps the mountain walker-performer ties a blue ribbon around the head. The more days in the High Land - the richer the veil of the ribbons grows. The embodied wild air, this floating veil articulates the vicinity to the sky and to the transitional state humans reach in the heights. ​during a solo mountain expedition in Siberia. Cairns - ongoing series of photographs of man-made stone-structures, encountered during numerous mountain walks and climbs. 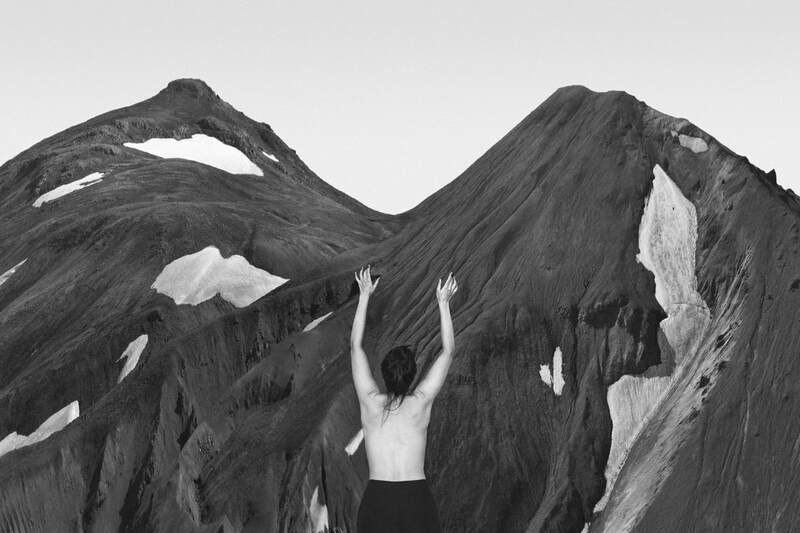 These “mountains on the mountains” mark the presence of human in the landscape. "But then you can say you have been to the highest point of Sweden"